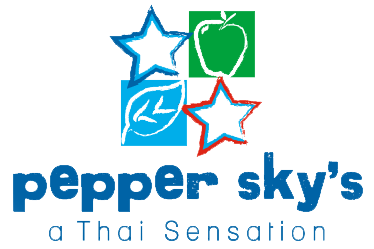 At Pepper Sky's we eschew the use of artificial ingredients, especially MSG. We make your dishes to order, so you can specify any subtle changes, like the addition of extra tofu or the substitution of onions. If you cannot have salt, let us know. If you want us to reduce the amount of oil used to prepare your dish, please tell us. While Pad Thai and other noodle and fried rice dishes necessitate the use of some oil, other pan fried dishes can be made with no oil whatsoever, please ask.